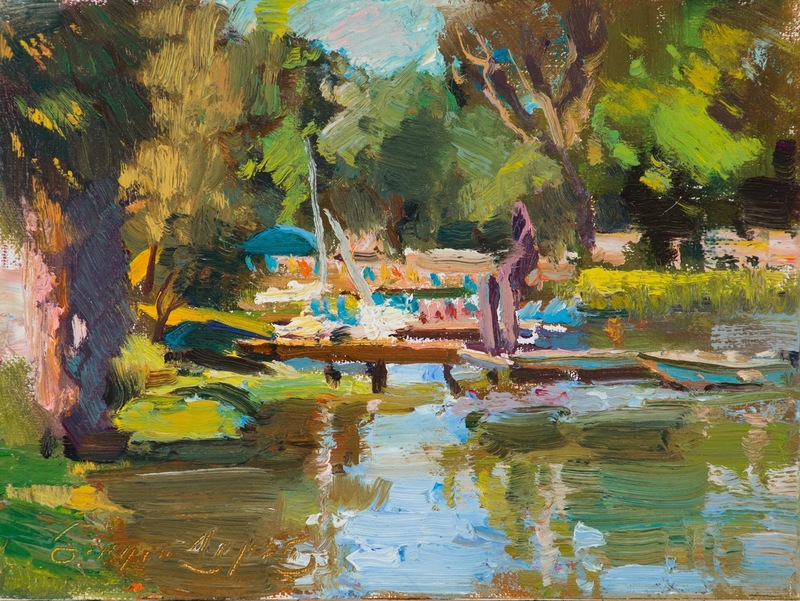 It had been 2013 since I had come to participate in Los Gatos Plein Air. Historically, I haven't done that great at this show, but they treat us so well, and it's such a fun time, that I have wanted to participate every year since. I almost didn't even apply this year because of not getting in again for years, and a lackluster sale last year. But I'm very glad I did. Let's walk through my adventures, ok? 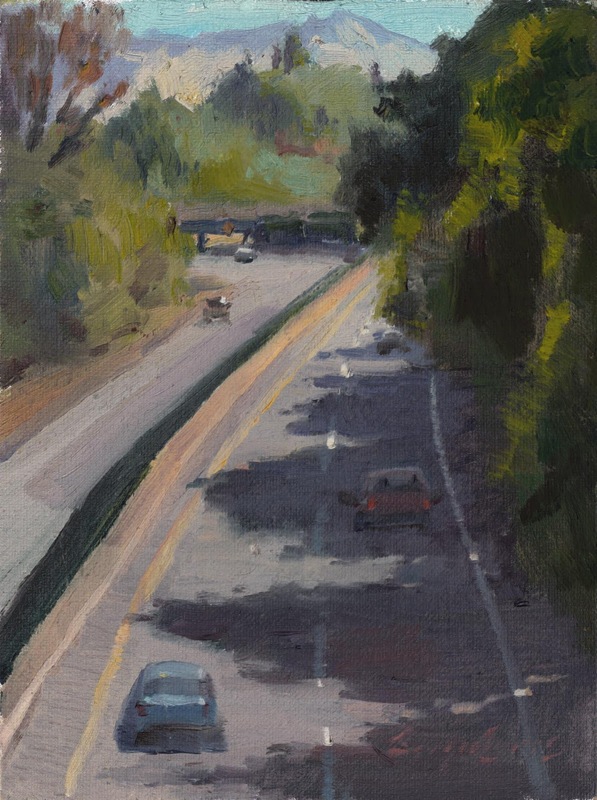 This was the first painting I did while in Los Gatos. It has some decent color I like, but the composition and design put it in the "Reject" pile for me. 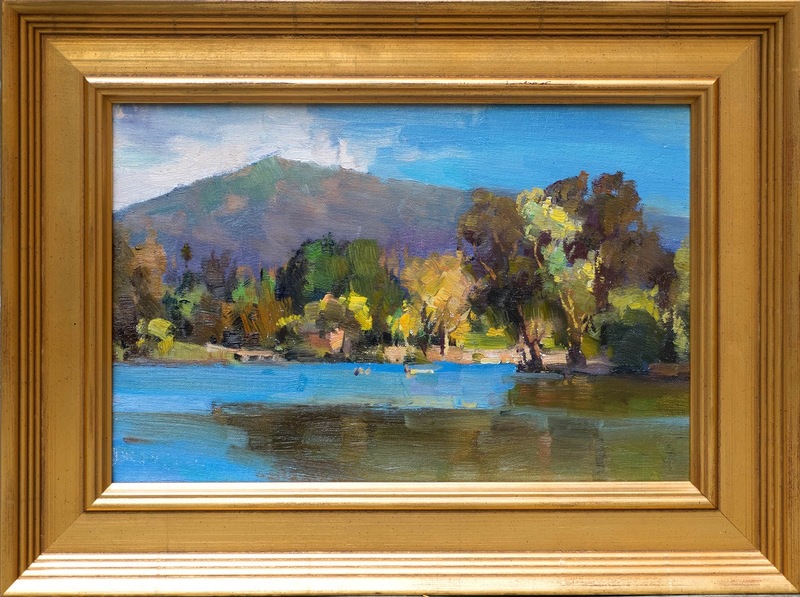 "Vasona Lake Afternoon" 8x12 inches. Oil on linen mounted on board. This one ended up selling at the show. I think the rich blues and subtle orange hits in the background foliage sold it. 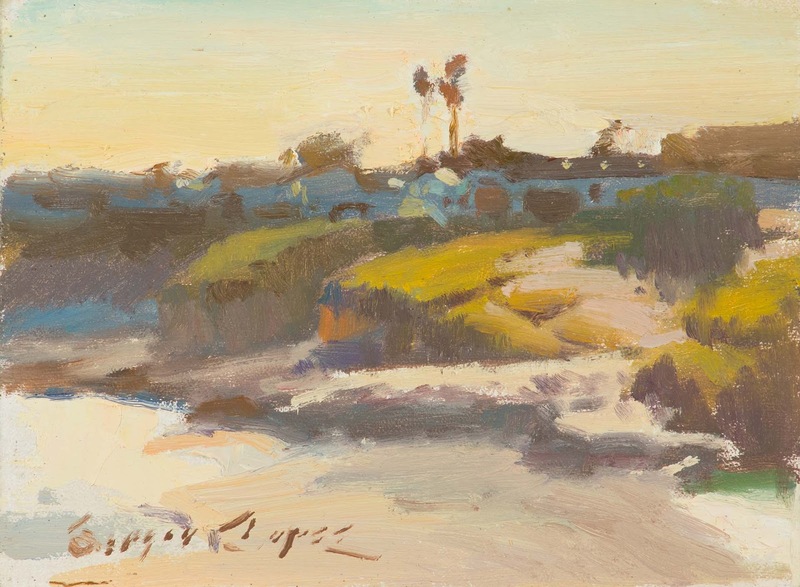 "Surf Cove, Capitola" 5x7 in. gouache on paper. Sold. Morningtime, looking east from Capitola Beach at New Brighton. 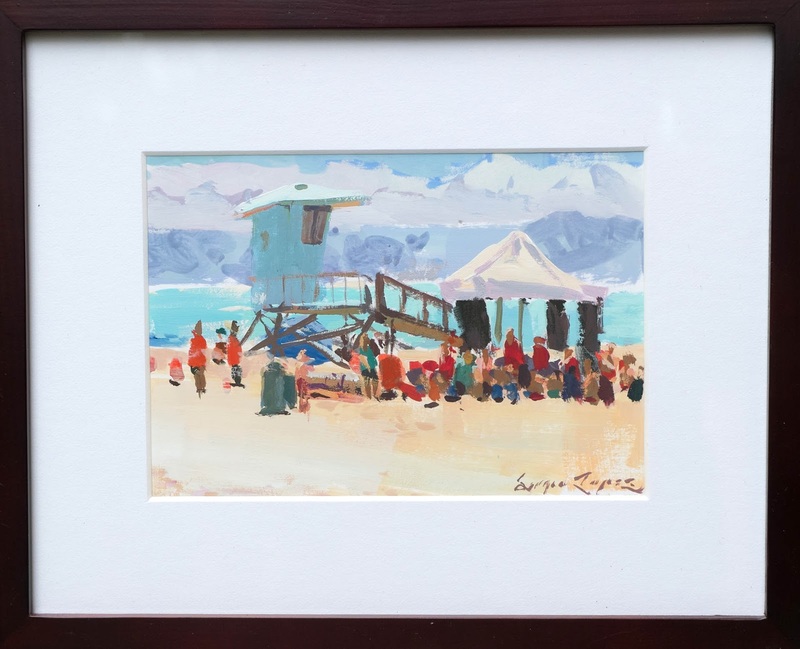 "Junior Lifeguards" 5x7 in. gouache on paper. Sold. I sketched the class of kids learning how to be lifeguards. Very California. 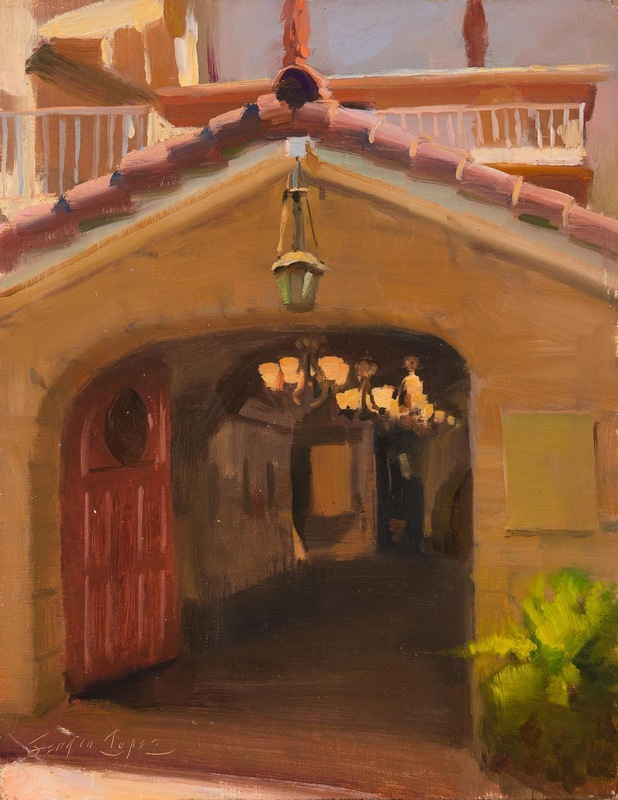 "Capitola Rooftops" 5x7 in. gouache on paper. Available for $150. It was a bit windy and hot with no sun shade, but i still had fun painting this one. I painted this one from the pier in Capitola. This painting sold first. 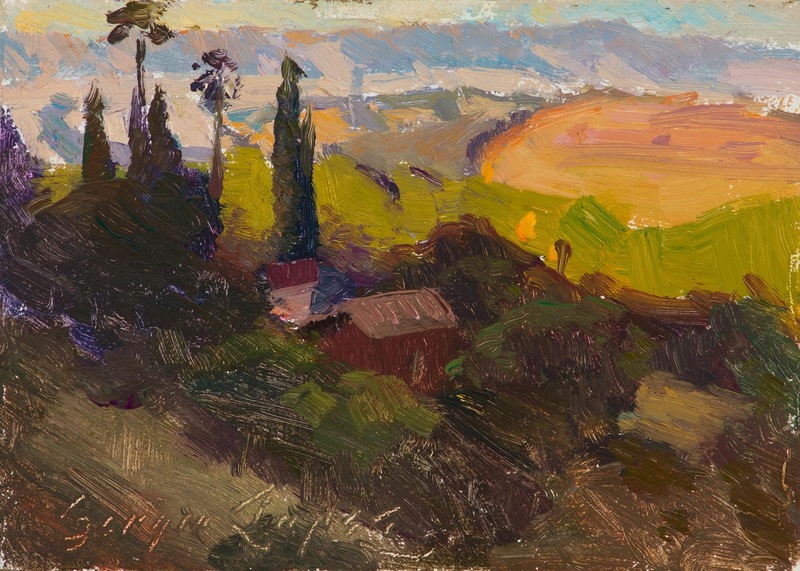 "Santa Crus Sundown" 6x8 inches. Oil on linen mounted on board. Available for $450. I love painting backlit seacliffs in the evening. The light, the color, the atmosphere, it's everything I love to paint en plein air. I will most likely do a larger version of this one. 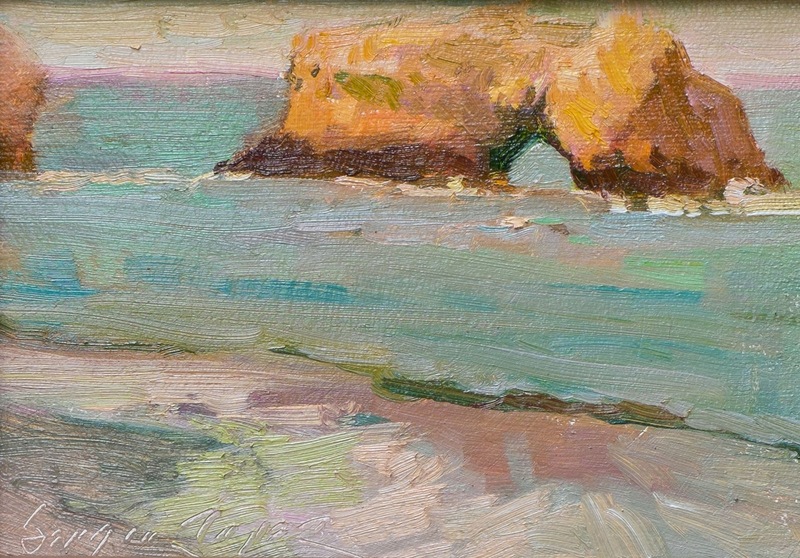 "Natural Bridge Sunset" 5x7 inches. Oil on linen mounted on board. Sold. I played with the color scheme on this one. It's like they say. If you get the value and color temperature right, you can do almost anything to the color. As a matter of fact, a lot of the time atypical color schemes will get you closer to the mood of the actual scene. I enjoyed painting this scene and I like the composition in this one, but I I think I can execute it in a more interesting way with enough practice. It's a little clumsy. I think I can make it better next time. "Novitiate Winery" 14x11 inches. Oil on linen mounted on board. 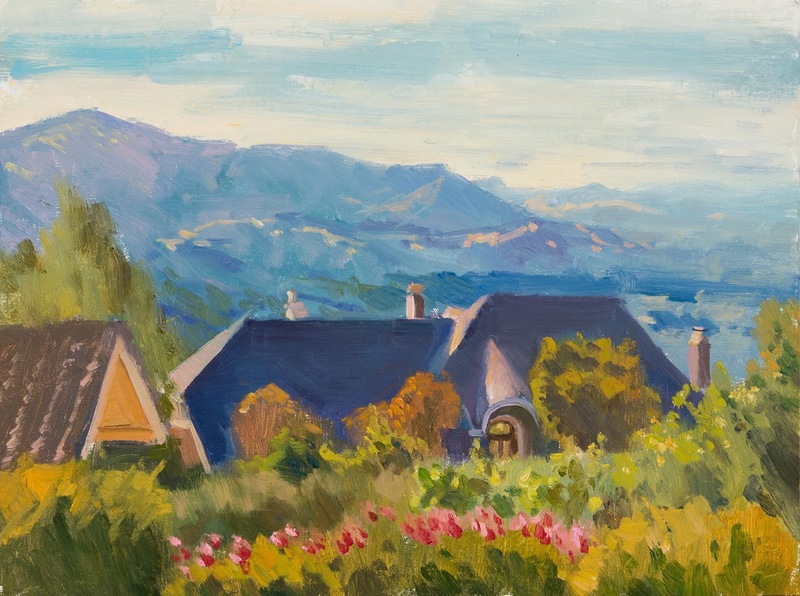 "Mountain Estate" 12x16 inches. Oil on linen mounted on board. Available for $1200. 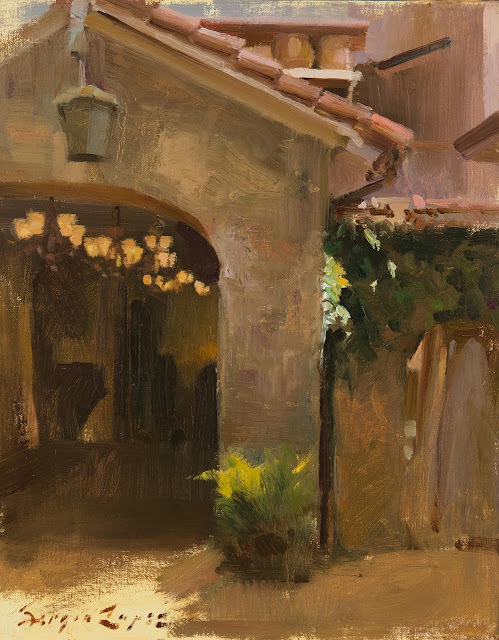 I was actually running out of places I was familiar with to paint, so I consulted our packet for a list of places to check out. I looked up "Aztec Road." It went along one of the hills around Los Gatos. It has some GREAT vistas that overlook all of Silicon Valley. The problem is, there is almost nowhere to park, This was the best view that wasn't obstructed by a huge house. Sure there is a huge house in this painting, but you still get a decent vista view. "Sierra Azul Sunset" 5x7 inches. Oil on linen mounted on board. Available for $350. This was one of my favorite paintings I did during the event. It was also one of the smallest. I liked the big dark shape caused by the hill shadow in the foreground and I think I did well with the color in the background. I forgot to take a good photo of the scene but I can substitute a scene around here to do a large painting of this one, I think. 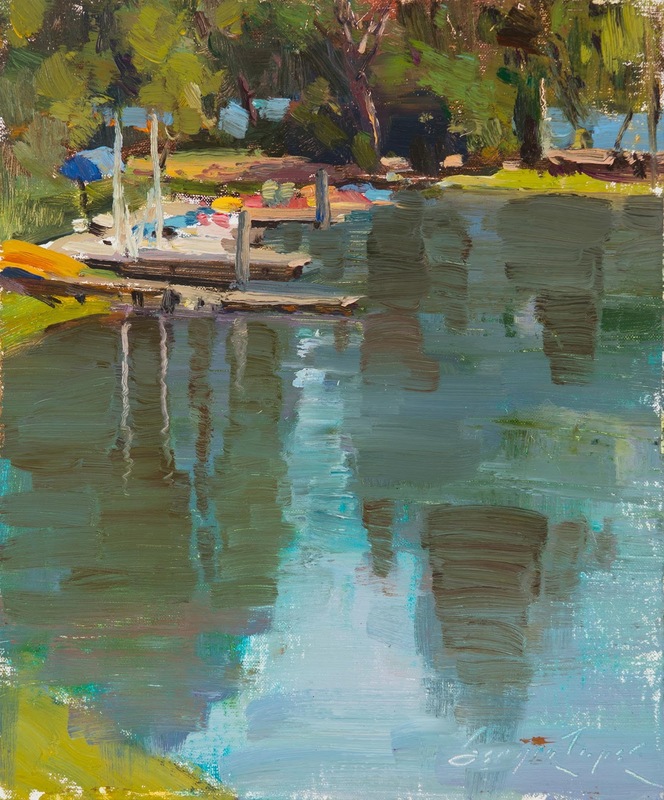 "Vasona Boat Launch" 12x10 inches. Oil on linen mounted on board. Available for $850. Now in events, I am trying to go back to scenes I enjoy in order to make better paintings if I'm not satisfied with the first attempt. The format of this painting worked better for the scene, and the design is much better than the 6x8. I contemplated putting this one in for my Artist/People's Choice consideration. "The Tasting Room" 14x11 inches. Oil on linen mounted on board. Available for $1000. I came back to Testarossa Winery to create this other version of the tasting room. On my second try, I was much looser, having the experience of painting it the day before. I made different choices design-wise as you can see, but the values and edges are better on this one. I don't know if or when they have made their decision on which one they are planning to use, but I think I have a good shot with this one. 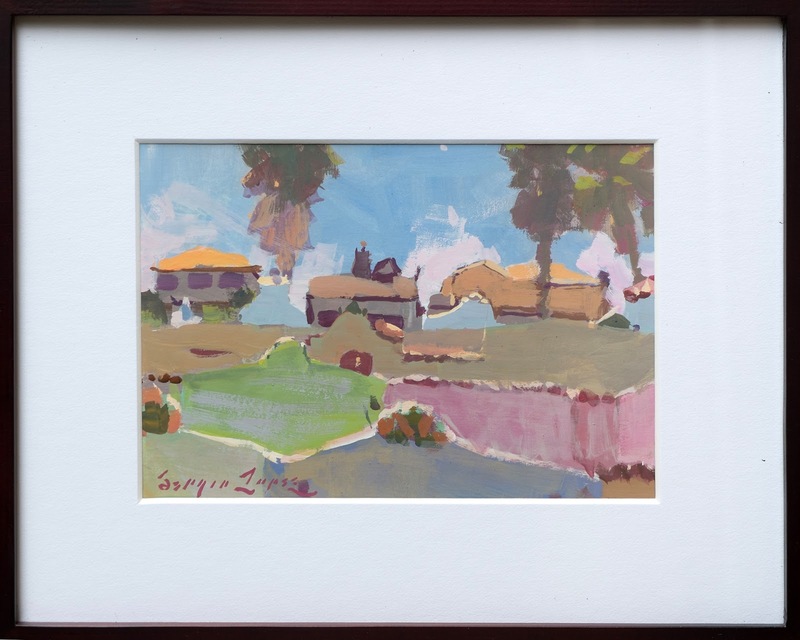 This year I went way beyond my previous sales years in Los Gatos, selling almost $1600 worth of paintings whereas before I've sold about 400-800 in previous years. My costs were kept very low, probably only spending $100 the whole time I was gone. I mostly subsisted on meals provided to us and the leftovers from it. I filled up my tank only once the whole time, and there wasn't much else I needed to spend money on(a couple of toiletries I needed anyways). It helped having a good range of painting prices and sizes. 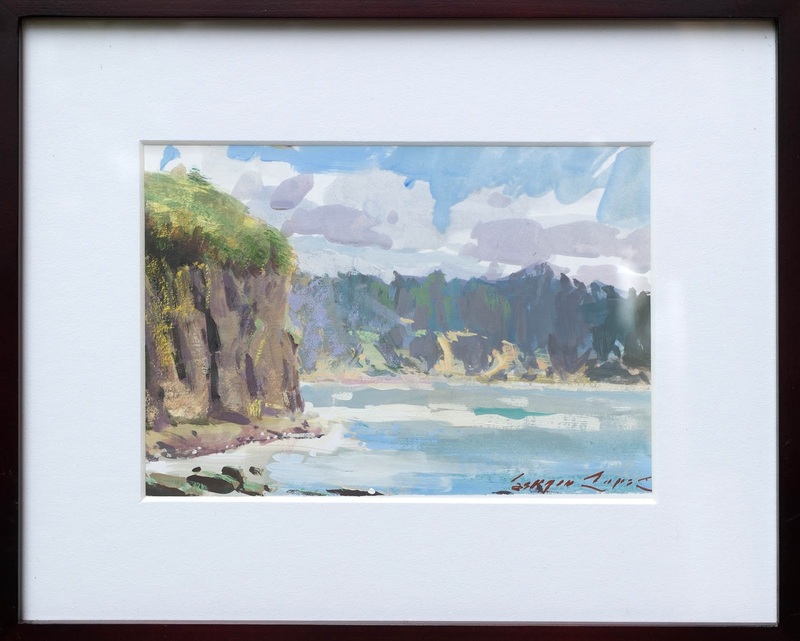 The group of gouache paintings paid off since they were within the reach of impulse buyers. The small works sell themselves, which is good since I'm a horrible p2p salesperson, lol. 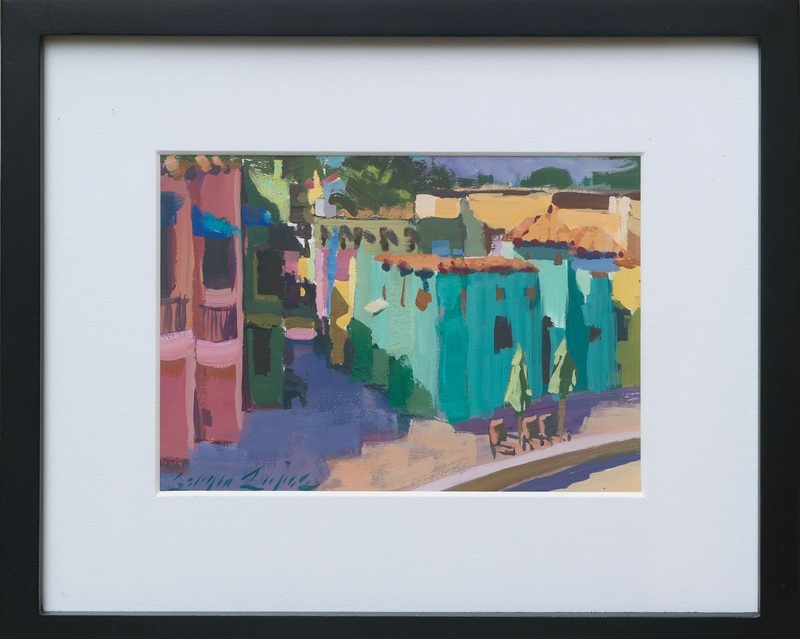 The nice thing is that the town of Los Gatos is starting to finally wake up to the art we're creating and it's beginning to pay off in the sales. Side note, the NUMU Museum in downtown Los Gatos has a good little show going on in its gallery right now. The range of work is kind of all over the place but I was surprised with who was showing. They had an Odd Nerdrum, Aron Weisenfeld, Seamus Conley, and even Brad Kunkle! I love Brad Kunkle's work so I was happy to see it in person as it's so rare for me to get to do.